After spending most of the Memorial Day weekend studying, I knocked out my 70-417 (Upgrading MCSA to 2013) and my 70-342 (Advanced Solutions on Exchange 2013), getting over a 900 on both, and earning the MCSE: Messaging! With half of my Unified Communications goals met, next up I’ll be focusing on Office 365 certification along with the MCSE: Communication (which focuses on Lync). Update 5/31/2013: DO NOT PUT YOUR LIST IN QUOTES! Putting the list of domain controllers within quotes causes Exchange to view that item as a single name, versus parsing out at the commas. I’ve updated the Powershell commands below to show it without the quotes. I’m back and in action working as an Exchange SME from being involved in an SCCM project for a few months, and one of the issues I ran into at a client is that they needed to roll out a few new domain controllers in their empty root domain as well as their child domain. Unfortunately there were some deployment issues that caused the OAB generation to fail when it his these problematic DCs. Once this was set, we ran into the age old issue that it wasn’t being reflected through the Get-ExchangeServer command. I don’t know WHY Microsoft did it this way, but you have to use the -STATUS switch to see the results reflected properly. I always prefer the format table command and list out each of the DC settings to ensure things took properly. This post is filed under Exchange, PowerShell. Update 7/13/2015 – Two and half years after the original post and finally some updates! I have had a chance to fully patch my environment to the latest updates for Exchange and Lync 2013. With some troubleshooting I have it working, and you’ll find updates scattered throughout this article. I had previously written an article on how to integrate Exchange/Lync 2010 for IM capability via OWA, and now that Exchange/Lync 2013 have been released, Microsoft has maintained the compatibility but thankfully with an easier-to-achieve process. Because of the Unified Communications Managed API (UCMA) 4.0 requirement on Exchange 2013 for the integrated UM role, both platforms have a similar set of prerequisite requirement. That was half the battle in 2010, because if you didn’t have the correct version of the patches, or didn’t install them in the right order, things would fail. 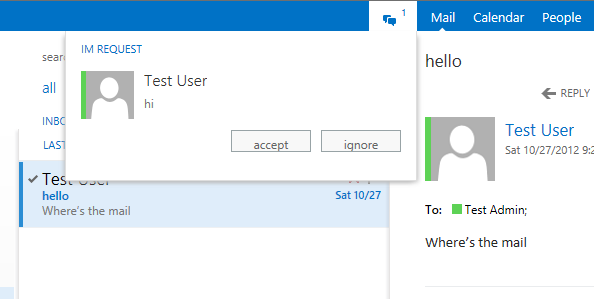 This post is filed under Exchange, Lync. Just this past week, Exchange 2013 has been RTM’d (Released to Manufacturing)! We’re still a few months away before the general public can start their installs, possibly longer for migrations since we’re waiting for the release of SP3 for Exchange 2007/2010 specifically for Exchange 2013 migration – but more on that later. For now, it’s time to take a look under the hood to see how Microsoft has revamped the setup process. Plus, we’re going to dig into some troubleshooting. 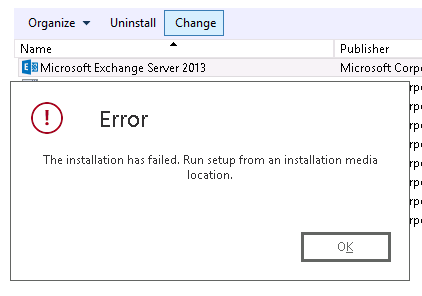 Now Microsoft has made the Exchange 2013 setup is pretty easy, but what happens when you run into problems? There are a myriad of different ways an install can go upside down, and I’m going to try to touch on as many as I’ve seen here. I guarantee it won’t cover them all but I’m more than willing to jump in and take a look with you – just leave me a blog post to take it from there. I’m going to start here and reiterate that the consistency of your installation media is PARAMOUNT. I’m not sure why I’ve seen so many install issues with Exchange 2013 because of a bad ISO or install EXE. I can’t say if it’s due to issues during the download, from the Microsoft end, or at the client end – take your pick, I’ve seen them all. I’ve even tried to copy the SP1 EXE package from a network share to my Exchange server and end up with the File is Corrupt message. You could get as far as one of the 15 steps for install and then magically have Exchange install bomb. The bad thing about this is if it happens during a step, and you try to rerun setup using this same media, it could make things worse to where you would need to perform something like the Uninstall & Cleanup process. For the self-extracting package, download right from the Microsoft site (or use a USB drive if you’re not virtual, but who isn’t these days) on the Exchange server itself, then expand to a folder on the same machine. Don’t try to expand to a network path!!!! In this scenario, using Programs and Feature to try and perform a change to fix what is broken. I’m working a project where they’re targeting a pilot group of users for mailbox quota information, and I was requested to put together a Powershell command that allowed them to put together a list of users, gather some information on each one regarding their mailbox usage, and dump that report out to a CSV. Well, it look a little bit of work, trial & error, plus all round Googling, but I’ve come up with the gem that works. Your input CSV, list.csv, needs only to be 1 column with Row 1 titled Name and the remaining rows as the first/last name of the users you want to gather information on. You’ll be able to pull the the total items, both in the mailbox and deleted items dumpster, as well as the size of the mailbox plus deleted items dumpster. If you want to add more rows from either the Get-Mailbox or Get-MailboxStatistics command, its pretty straight forward! Now it’s official – I’m an Enterprise Messaging Administrator on Exchange 2010!